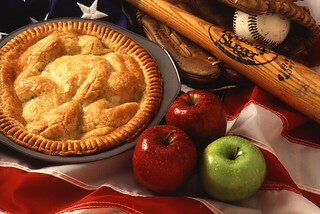 Apples are an all-American success story and Americans eat more than 19 pounds of them annually. Thanks to the U.S. Department of Agriculture’s (USDA) Agricultural Research Service (ARS) fruit-breeding research, the U.S. enjoys more productive, healthy, and flavorful new varieties every year. USDA ARS has even worked on bashless bagging-packaging systems that are used by wholesalers to bring you apples without bruises. USDA photo by Scott Bauer.